I am writing this review from my lovely house in Austin, Texas. The free standing house in which no one lives above or below me. The house that has a lot of air between it and the walls of my next-door neighbors’ houses. I am typing these words as the landlord of this house, which I own. At the same time, I am just two brief years removed from my 14-year stint as a serial renter in New York City. Which is to say that Brian Bolster’s painfully hilarious One Year Lease left me feeling all sorts of contradictory emotions: frustration, relief, despair, glee. At its core, Bolster’s cine-essay tells a universal story: an optimistic, downright hopeful subject discovers, once a 12-month lease has just been signed, that his or her landlord is actually batshit looney tunes. Great. However, when it comes to this film in particular, as soon as we hear the first words out of landlord Rita’s mouth on Bolster’s voicemail, it becomes without question a distinctly New York City tale. NYC has its particular brand of crazy person, but when it comes to the city’s landlords… actually, please excuse me while I get up and walk into my backyard and lie down in the grass and stare up at the sky and remind myself that I don’t live there anymore. The visual component of Bolster’s 11-minute short consists of observational footage—akin to a patient nature doc—of the apartment itself, both interior and exterior. 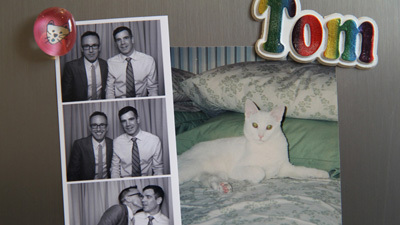 Bolster and his boyfriend, executive producer Tom Harrington, make brief appearances throughout, but the real star of the show is their cat Casper, who doesn’t appear to be phased by the drama unfolding through their voicemails. Lucky Casper. As interesting as that footage is, and though it does provide its own helpful narrative arc with images of moving in, living in, and moving out of this excruciating situation however many not-soon-enough months later, the reality is that One Year Lease could have been audio played over a black screen and it would have still been a big winner. For the star of this show is Rita herself, a figure that one would love to categorize as “an inimitable New York City character,” only the nightmarish truth is that there’s another one like her hiding behind the curtain right next door. Truthfully, in all my years of renting in New York City, I only had two landlords that I would consider to be outright nightmares. But I have friends who have lost the lottery time and again. While my first instinct is to recommend this hilarious, entertaining film unabashedly to them, I also fear that it might trigger some sort of freakish NYCPTSD flashbacks. I guess no matter who you are or where you are, this disclaimer applies: if you are currently in the midst of landlord troubles, be forewarned when watching One Year Lease. For everyone else, wherever you are, feel free to watch this film and laugh… enjoy… rejoice.